These sets are in used condition. Some paint may be missing on the figures. 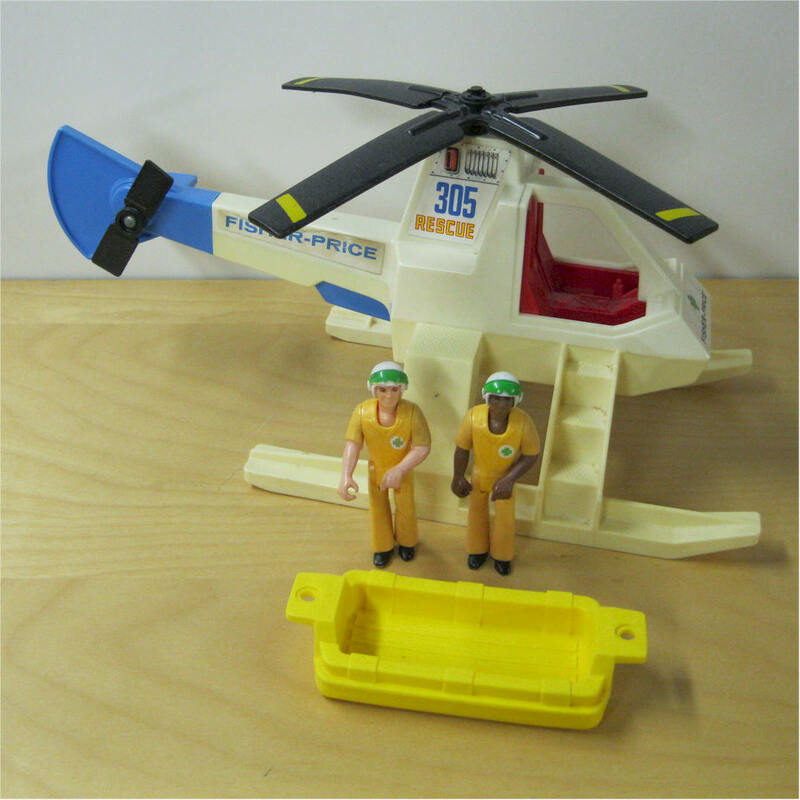 #305 Adventure People Air-Sea Rescue Copter. 1975-1980. 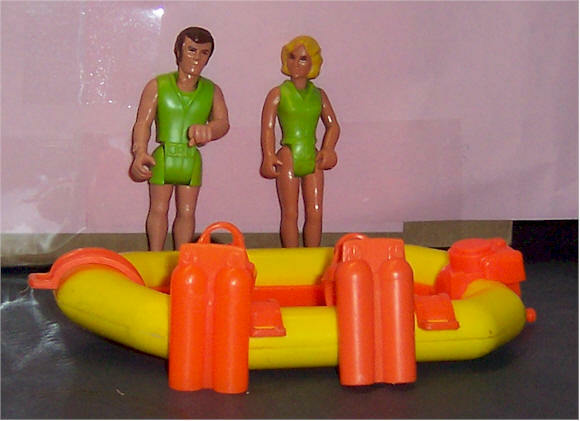 Helicopter and gold color raft, two gold color figures, jess and Roger. Normal wear. 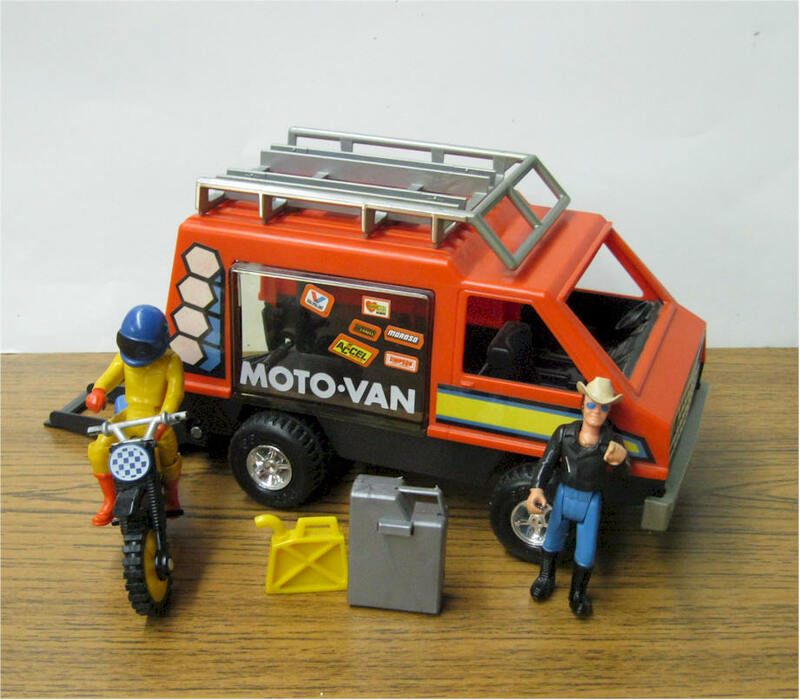 #335 Adventure People Moto Cross Team (Super Rare) Van with ramp tailgate and roof rack. Dirt bike and two gas cans fit on roof rack. 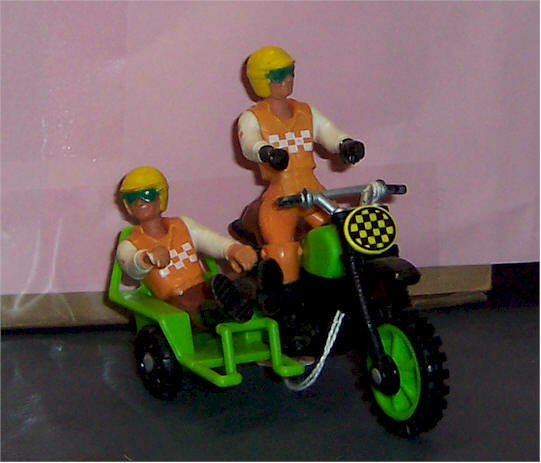 Race driver and teammate figures motorcycle. #312 Adventure People Northwoods Trailblazer. Made 1977-1982. 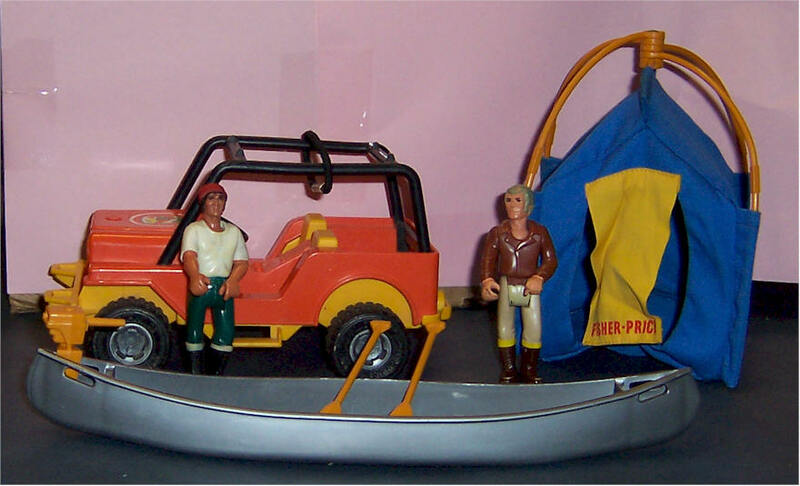 Orange and yellow jeep, two-piece cloth tent, canoe with two oars, clip-on motor, Explorer, Brad, and Hawk. 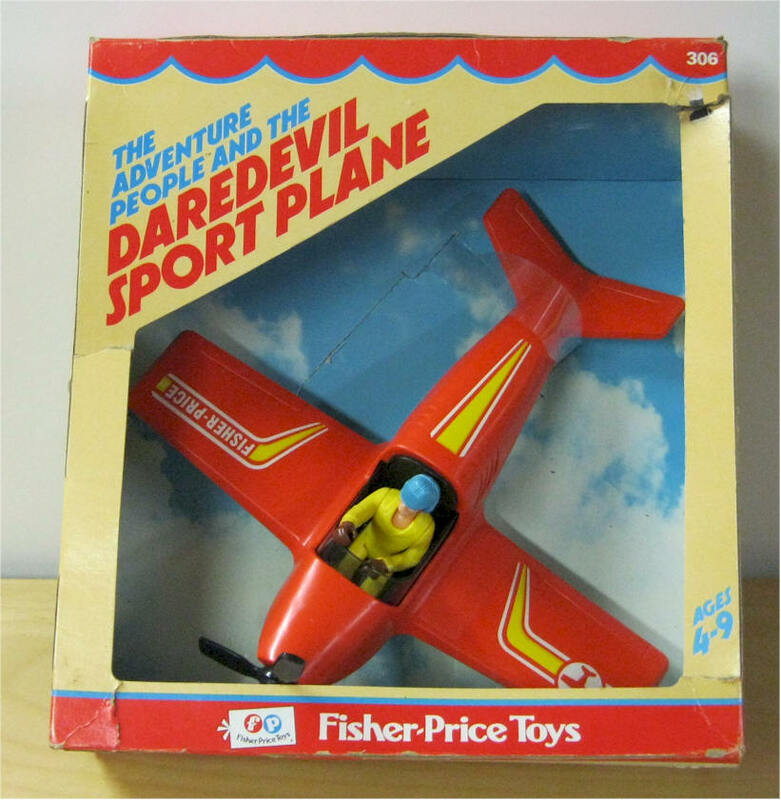 #354 The Adventure People Daredevel Skydiver. 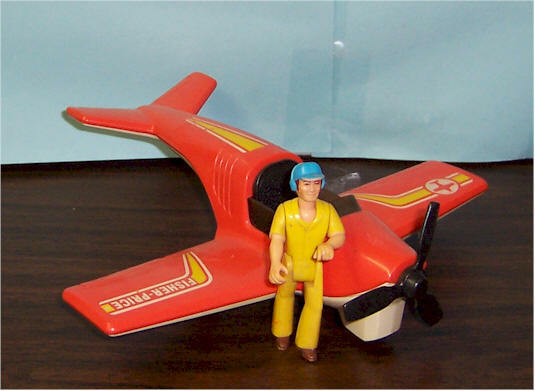 Made 1977 - 1981, Skydiver in jumpsuit with chute and detachable harness. #318 The Adventure People Daredevel Sports Van. 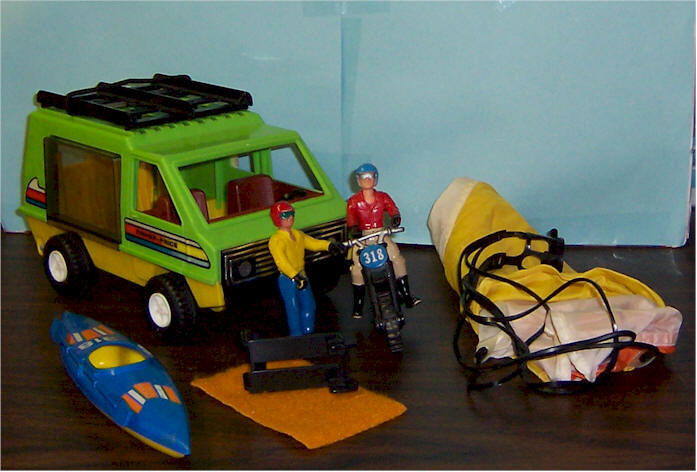 Made 1978 - 1982, Customized van, parachute with harness, racing kayak with paddle, racing bike with rack that attaches to back of van, and two helmeted figures. Hard to find Mate. #304 The Adventure People Wild Safari Set. Made 1975 - 1978. 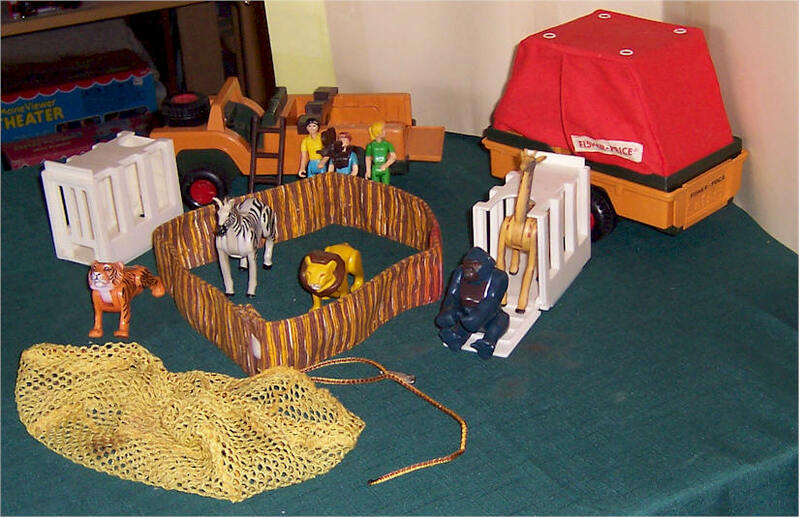 Orange two-seater Jeep with passenger bench and trailer, clothe stockade fence, four figures , Safari Jim, Mom, Johnny, and Jenny, movie camera, five animals, gorilla, zebra, lion, tiger, giraffe, collapsible cloth tent, two cages, capture net, and ladder. Safari Jim missing in picture. 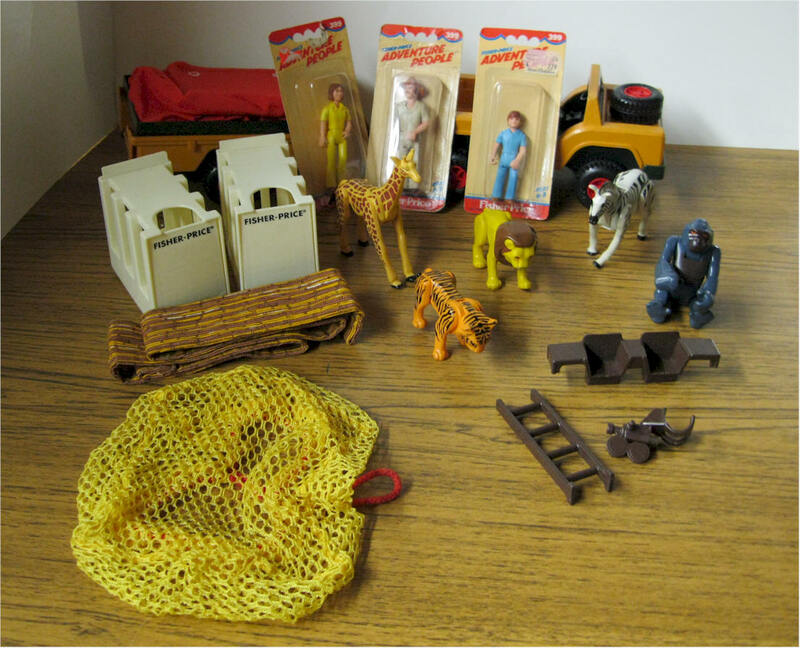 #304 The Adventure People Wild Safari Set. Made 1975 - 1978. 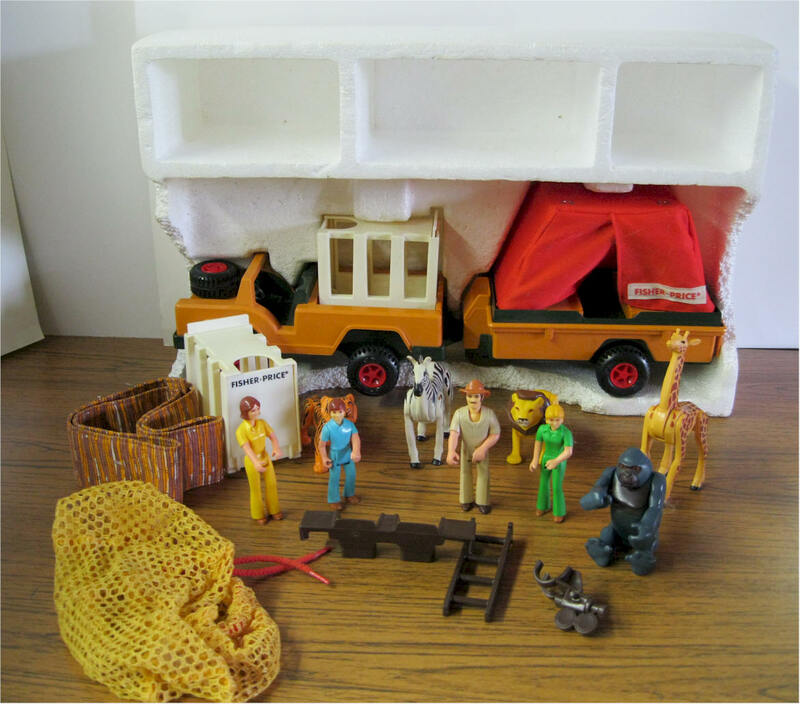 Orange two-seater Jeep with passenger bench and trailer, clothe stockade fence, four figures , Safari Jim, Mom, Johnny, and Jenny, movie camera, five animals, gorilla, zebra, lion, tiger, giraffe, collapsible cloth tent, two cages, capture net, and ladder. All figures come in original package. 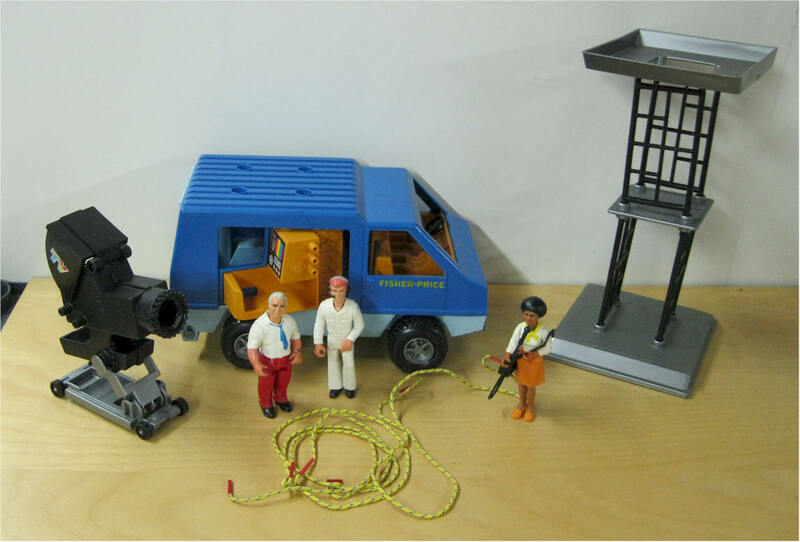 Set is in excellent condition. #356 The Adventure People Cycle Racing Team. Made 1977 - 1984. Cycle with side car and two racing drivers. #353 The Adventure People Scuba Drivers. Made 1976 - 1981. Divers Matt and Becky with scuba tanks and diving raft. #310 The Adventure People sea Explorer. Made 1975 - 1980. 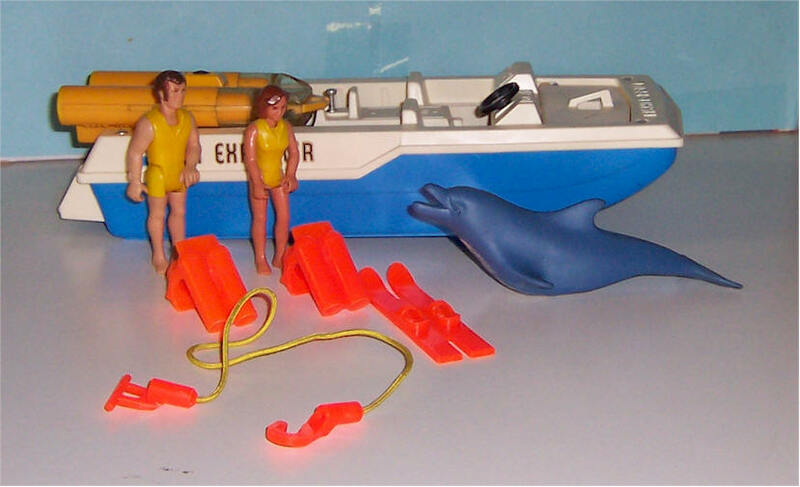 Motor boat, sea sled, two divers, Dave and Mary, skis, and two clip-on scuba tanks and Splash the dolphin. #307 The Adventure People Wilderness Patrol. Made 1975 - 1979. 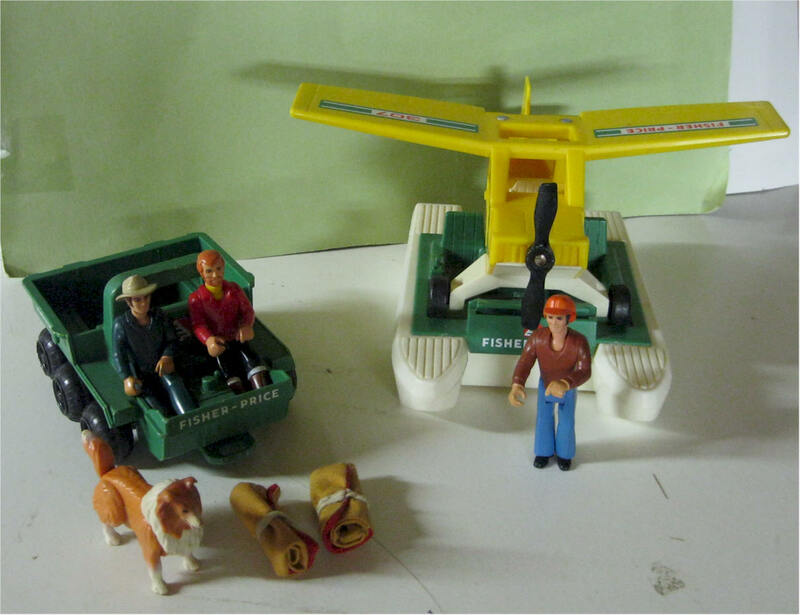 Bush plane, pontoon boat with motor and all-terrain vehicle carry three crew members, ranger, Scott: pilot, Greg: woodsman, Red: and collie dog. Two sleeping bags. Accessories for the #323 The Adventure People Aero-Marine Search Team. 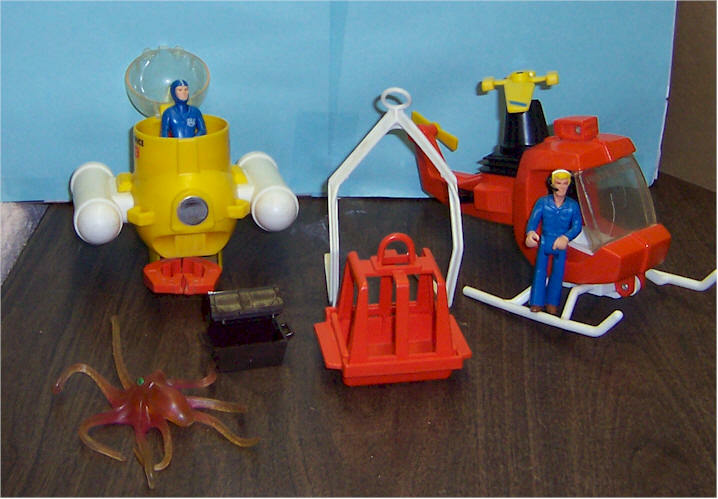 Helicopter with hook and pilot - submarine with diver in wet suit, octopus, treasure chest, cage with cradle and scuba tank. #322 The Adventure People Dune Buster. 1979-1982. 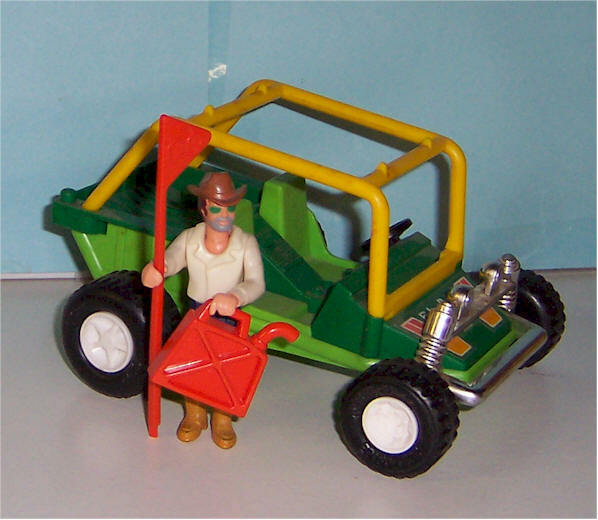 Green off-road vehicle, flag, spare gas tank, driver wearing boots, glasses and hat. #309 Adventure People TV Action Team. 1977-1978. Blue van, main camera that focuses, seven-piece tower for camera, mini-cam, three cables. Announcer, Carole; technician, Kirk; and director, Jeff. Set complete. #355 Adventure People White Water Kayak 1977-1980. 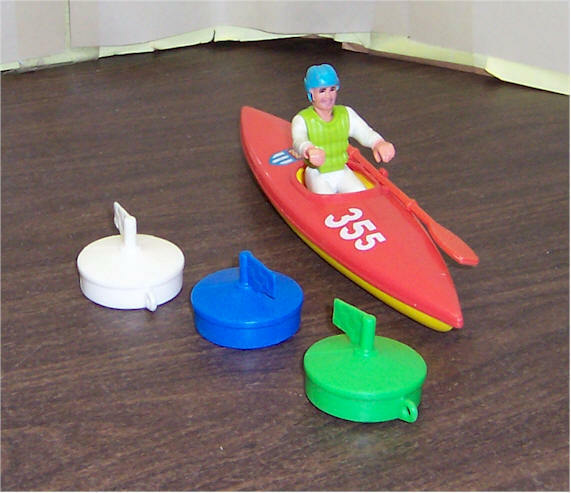 Includes Kayak, boater in life vest, paddle, and three buoys. #334 Adventure People Sea Shark. 1981-1984. 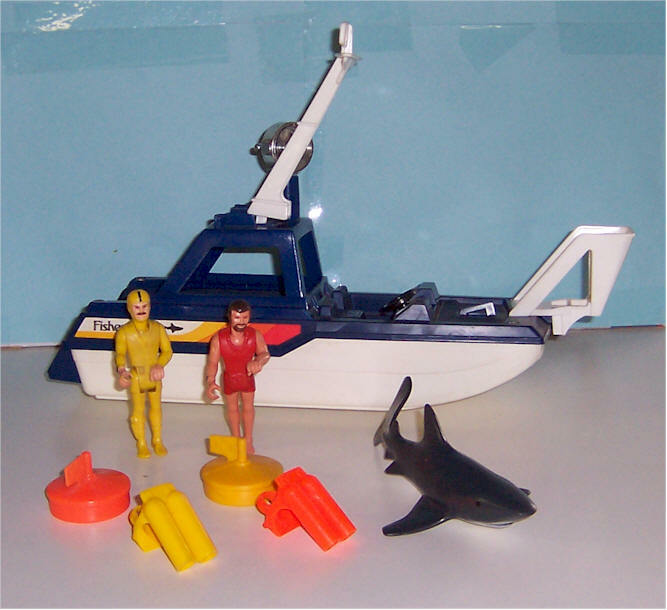 Includes blue and white patrol boat, two divers in wet suits, two scuba tanks, Shark and two buoys. 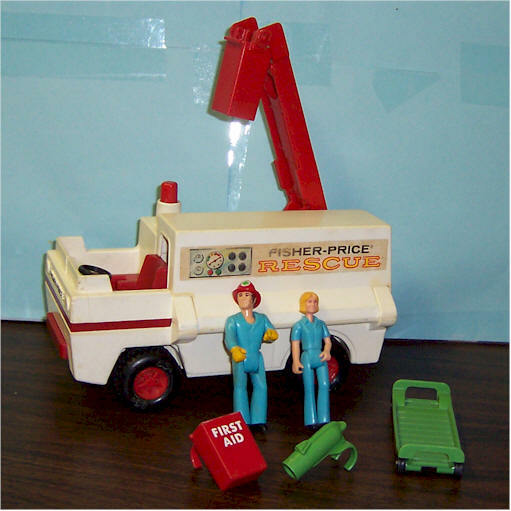 #303 The Adventure People Emergency Rescue truck. 1975-1978. 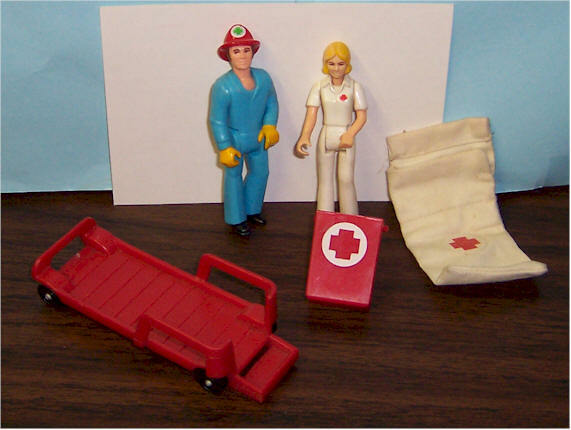 Rescue truck with extendible boom and siren button, green stretcher, oxygen tank, blue figured man, Tom, and woman, Nancy. #352 The Adventure People Construction Workers. 1976-1979. 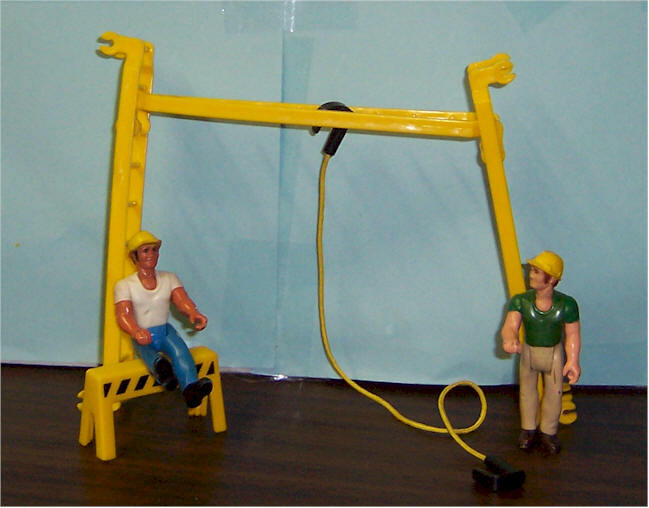 Barney and Frank with hard hats, three-piece ladder, 15" cable with hooks, and barricade sign. 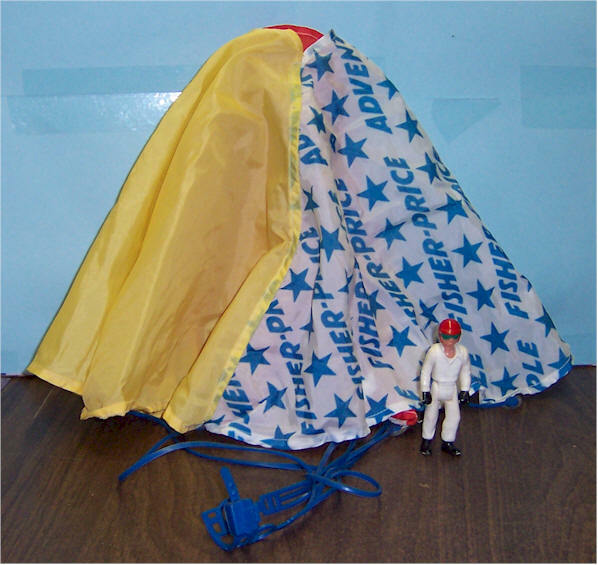 #358 The Adventure People Deep Sea Diver, 1980-1984. 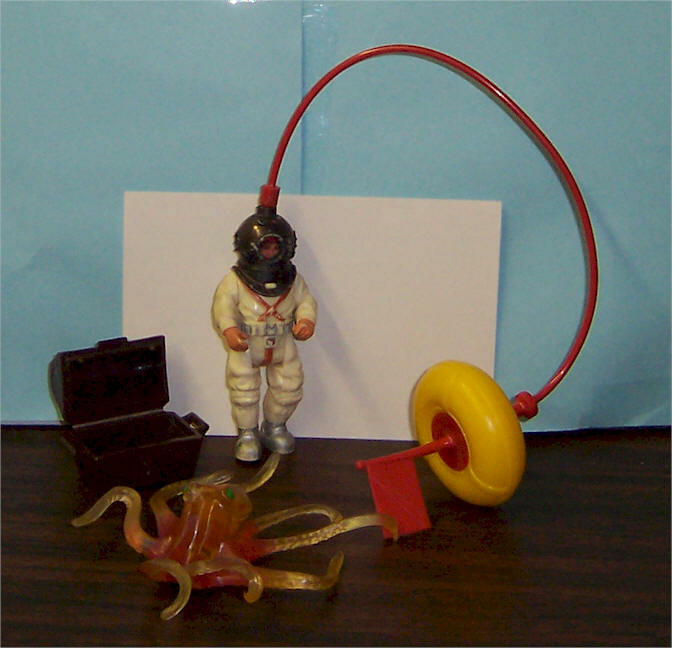 Diver in brass helmet, dive float with flag and 10" air hose, and octopus. Set is complete. 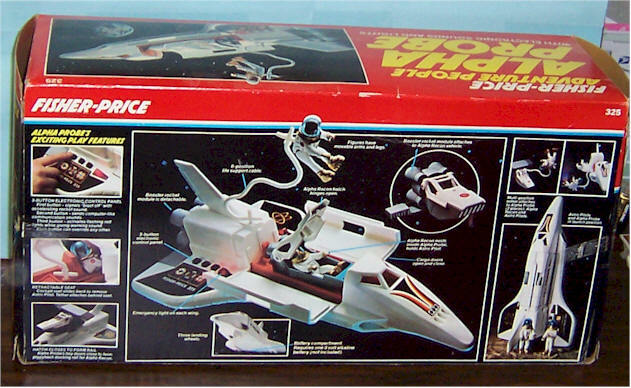 #325 Adventure People - Alpha Probe with el3ectronic sounds and lights. Mint in box. #326 Adventure People - Alpha-Star. Complete. Mint in Box. 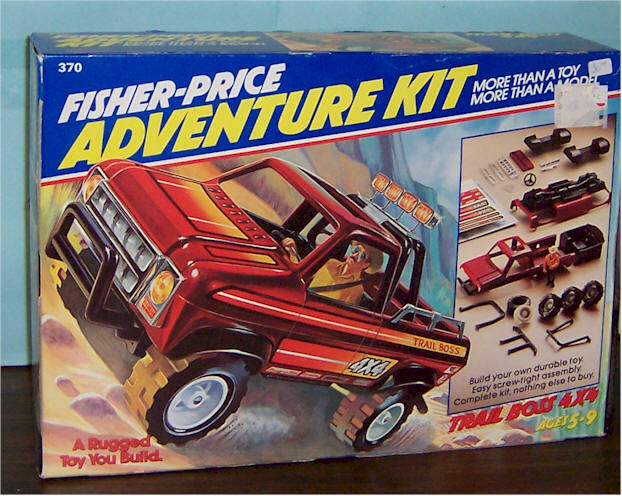 #370 Adventure Kit - Trail Boss 4 x 4. 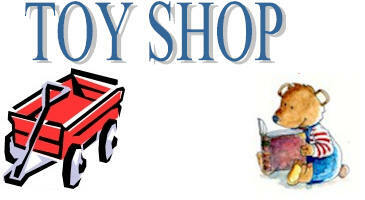 The kit comes with everything needed to assemble and decorate the toy. Mint in box. 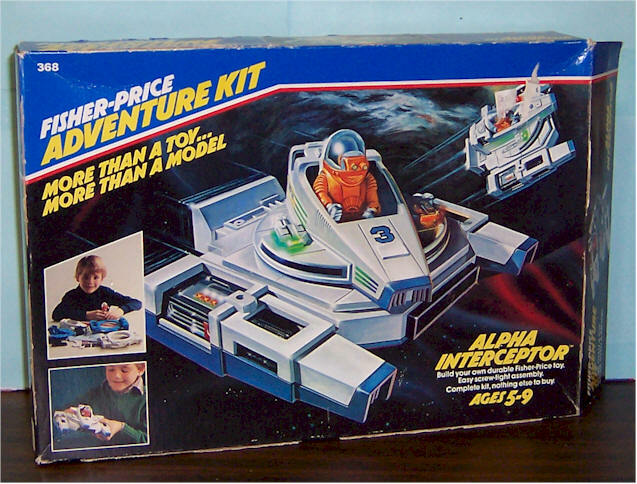 #368 Adventure Kit - Alpha Interceptor. 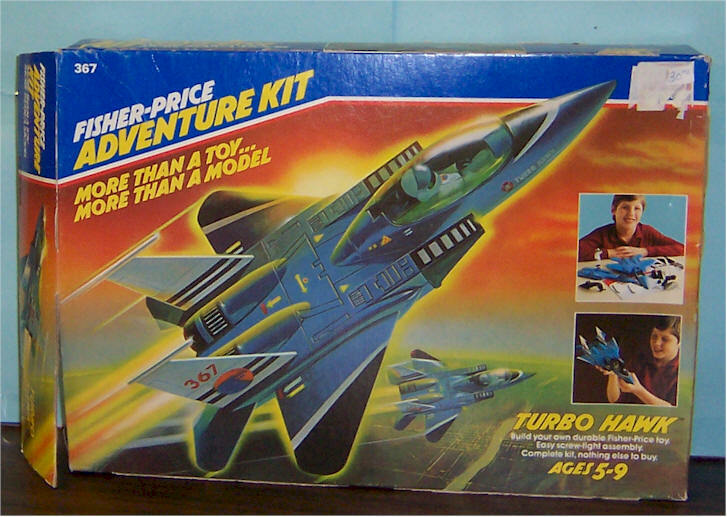 #367 Adventure Kit - Turbo Hawk. Mint in Box. #360 Adventure People Alpha Recon. 1982-1984. 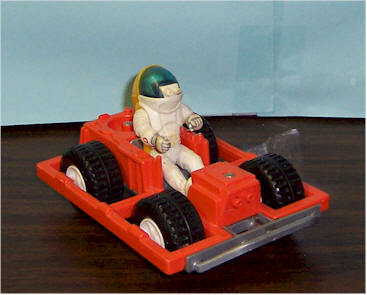 Includes Red four-wheel vehicle and figure in white space suit with vision glasses. #357 The Adventure People FireStar 1. Made 1980 - 1984. 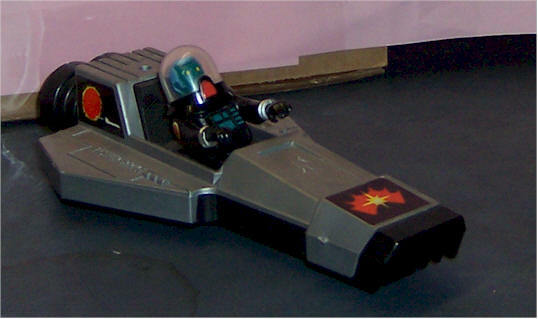 Silver rocket sled and pilot in black space suit. 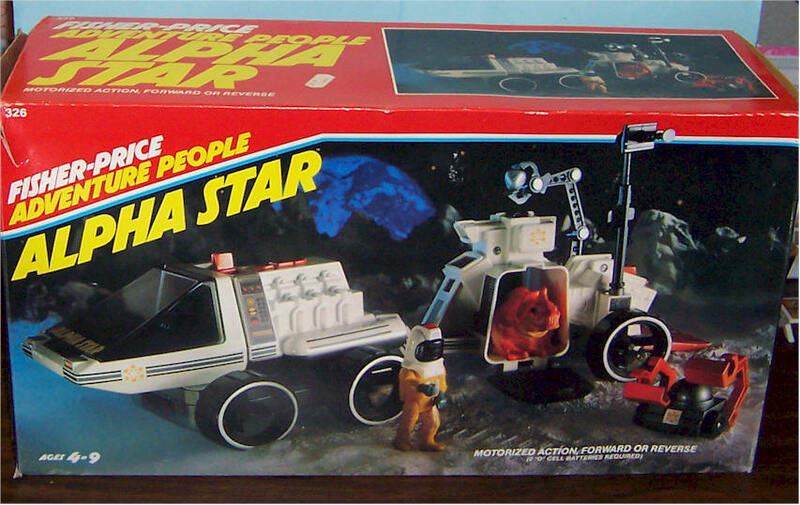 #357 The Adventure People FireStar 1. Made 1980 - 1984. 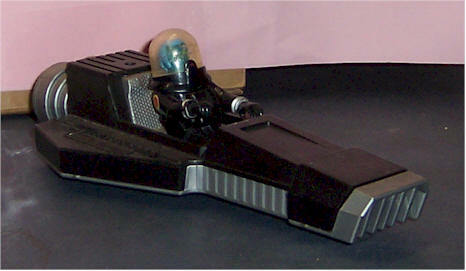 Black rocket sled and pilot in black space suit. 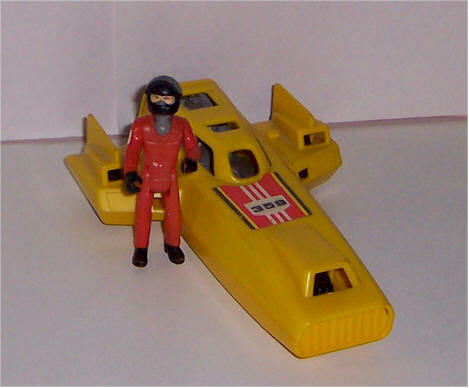 #308 The Adventure People The Super Speed Racer Made 1976 - 1979. White speed racer with driver Buzz. 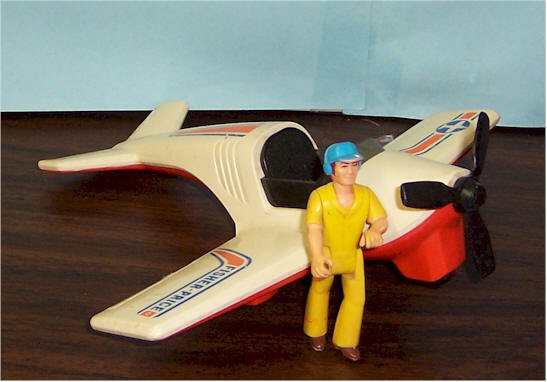 #359 The Adventure People Land Speed Racer. Made 1981 - 1984. Yellow salt flat car and driver.